In the opinion of the survey, this property appears to meet the criteria of the National Register of Historic Places. In the opinion of the survey, this property appears to meet the criteria of the Seattle Landmarks Preservation Ordinance. In the opinion of the survey, this property is located in a potential historic districe (National and/or local). This distinctive Prairie style residence was built in 1912 for George L. and Beatrice Dearborn Hager. According to Who's Who in the Northwest (1911) Mr. Hager, born in Indiana in 1885, was self-taught in drawing and began work as a cartoonist for the Seattle Post-Intelligencer in 1905, when he was only 20 years old. He married Beatrice Dearborn in 1910. In 1935 the house was purchased by Lyman H. Black, treasurer of the Black Manufacturing Company, and his wife Marion; the Black family built several prominent houses on Queen Anne. Later owners included J. Adron Troxell (vice-president of Puget Sound Bridging and Dredging, 1940s); George B. Moore (physician, 1950s); William B. Laney , Jr. (Dow-Laney Company, 1960s); and Anthony Zamberlin (president, National Sign Company 1970s-80s). The Zamberlin family still owns it. The architect, Andrew Willatsen, came to the United States from Germany in 1900, working first as a carpenter. In about 1902 he began work at Frank Lloyd Wright’s studio, where he remained intermittently until 1907. This was the studio’s most creative period, and he had the opportunity to work on such well-known buildings as the Darwin Martin house in Buffalo and the Larkin Building. In 1907 he moved to Spokane, and the following year came to Seattle as a representative of Cutter and Malmgren to supervise construction of the Seattle Golf Club. In 1909 he formed a partnership with Barry Byrne. They completed the Northwest’s most prominent Prairie style works, including the Handschy House, a designated landmark on Queen Anne. 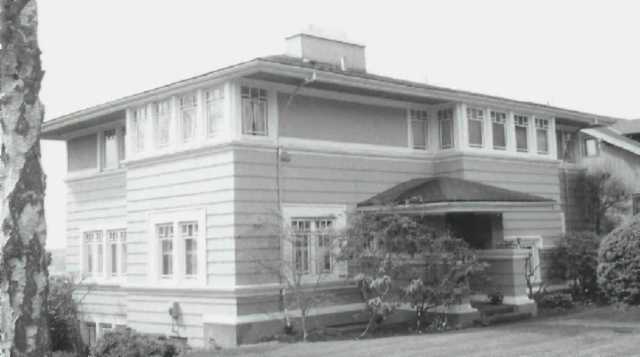 The partnership dissolved in 1913, and Willatsen then designed the J. C. Black House (demolished 2004) on Queen Anne. He remained in practice until 1959, designing eclectic houses and commercial buildings as well as those such as this one that show the Prairie influence. According to the building permit, the house was constructed by W. J. Henry, a local contractor. This house features many characteristics of the Prairie style, including a hipped roof with deep eaves, strong horizontal lines reinforced with a prominent water table and belt courses below the windows on each floor, and banks of windows on the second floor. The courses of wood shingles on the first floor further reinforce the horizontality, as does the use of stucco on the second floor. The entry is in the center of the main (north) façade, sheltered by a hipped roof and high side walls. West of the entry a bay projects about three feet; a similar bay is at the corner on the east elevation. The banks of windows turn these corners. They are casements with a five-over-one configuration and wide wood surrounds. They are arranged in groups of four on the second floor and in pairs on the first floor. The house sits on a steep hill, with a daylight basement, a concrete retaining wall and a garden to the rear (south). City of Seattle DCLU Microfilm Records. King County Property Record Card (c. 1938-1972), Washington State Archives. Ochsner, Jeffrey Karl, ed. Shaping Seattle Architecture, A Historical Guide to the Architects. Seattle: University of Washington Press, 1994.